Skincare is important all year round, but I think it’s even more important in the autumn and winter months. Where I live in Scotland, the weather can completely change over the course of an hour; one minute there’s glorious sunshine, the next it’s pouring from the heavens. Indoors, temperature controls switch between heating and air conditioning as though they were TV channels. As a result, I feel that my skin becomes dried out – not ideal! These are the products that I’ve been using to keep my skin in tip-top condition. Some products are used all year round; others are incorporated into my routine especially for these 6 months of the year. I don’t use every product every single day, as you may be able to tell; however, I generally use each one within a 2-3 day period. I also recently uploaded a video showing you all the products below – you can watch it HERE. Let’s start off with cleansers! I currently have 2 cleansers that I’m using. The first is Simple Kind to Skin Micellar Cleansing Water – I’ve raved about this product SO many times already! I love using this to freshen up my skin first thing in the morning, after I come out of the shower, or to remove light makeup at night. I love how refreshed my skin feels after using it, it just feels so clean! Like all of the Simple range, it’s not harsh on skin – and mine is sensitive as well as combination, so if it’s fine for me, it’s fine for pretty much everyone! Alongside it, we have Lush Ultrabland Cleanser. I started using Ultrabland earlier this year – there’s a review HERE if you want to check it out. It’s made from almond oil, which is one of the most gentle ingredients for removing makeup. I love how gentle it is on my skin, yet still effective at removing makeup. 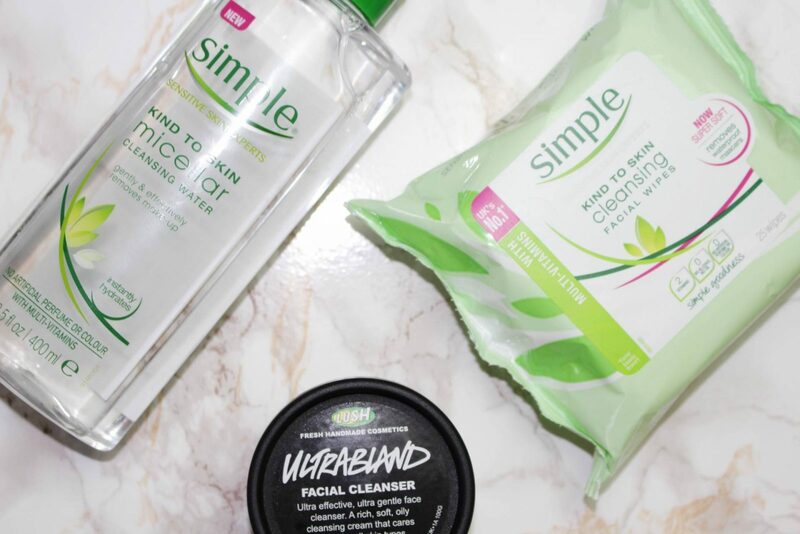 As it’s oil-based, it can leave my skin feeling a little greasy once I’ve removed it with a damp cotton pad – but a little micellar water sorts that right out! I tend to swap between these two products when I’m in the shower. 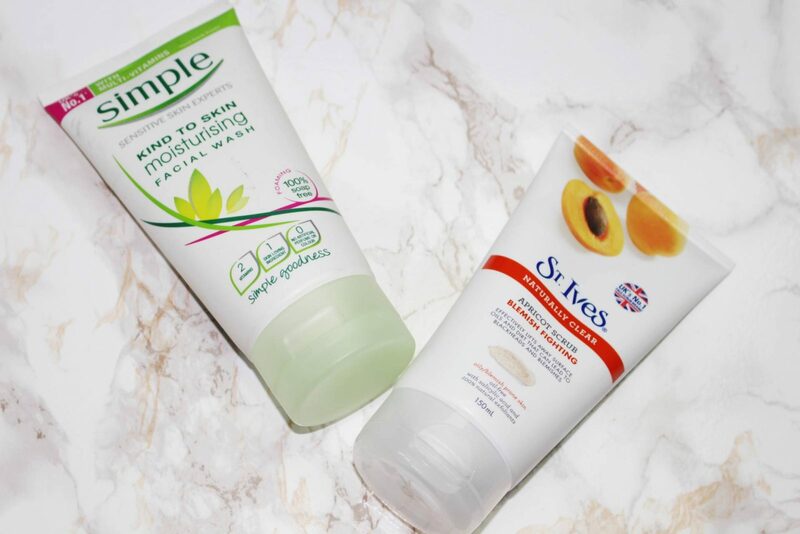 I adore St Ives Blemish Fighting Apricot Scrub for exfoliating my face – although I admit that I use it a little too often! I know I should only use it once or twice a week, but I can end up using it 4 days out of 7, especially if I’ve been wearing a lot of heavy makeup. It leaves my skin feeling smooth, without the product being too harsh on my skin. Some scrubs have quite abrasive textures, but this one is perfect for me. For the days in-between, I love using Simple Kind to Skin Moisturising Facial Wash. 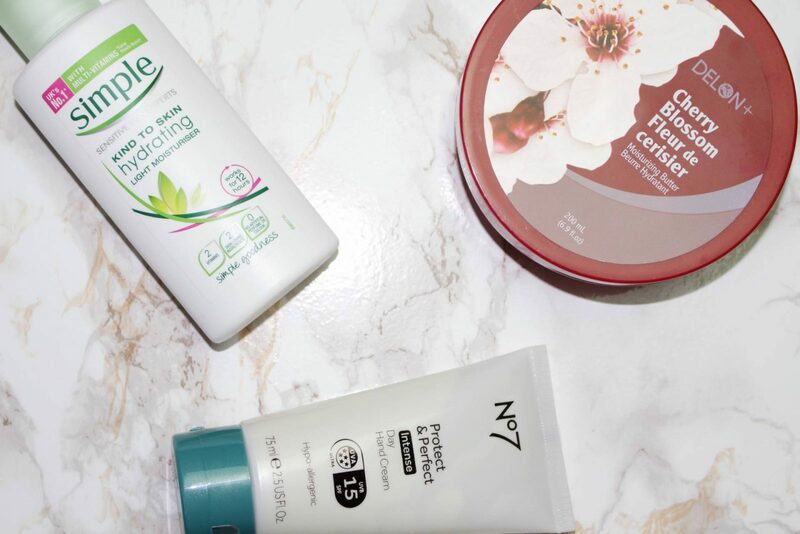 So many face washes are full of spot-fighting ingredients which really flare up my skin (something I discovered around the age of 12 or 13!) Even now, I find that a lot of face washes can leave my skin feeling tight or red – but this one just leaves it feeling clean. There’s no strong ingredients and it’s 100% soap free, which my skin seems to like. Onto some of my moisturisers! On the left, we have my everyday moisturiser – Simple Kind to Skin Hydrating Light Moisturiser. I’ve been using this moisturiser for around 2 years or so; I was previously using the Replenishing Rich version, but found that it made my T-zone quite oily. Not ideal, especially under makeup! The hydrating version is a lot lighter and gives me the perfect level of hydration under my primer and foundation. I also love that you don’t need lots of product, so one bottle lasts me quite a while despite using it almost every day. Alongside my moisturiser, we have my current body butter. I received this as part of a gift set ages ago, and have no idea where it’s from – but it smells like cherry blossom, so it’s a win for me! It doesn’t absorb quite as quickly as I’d like, so I don’t tend to use it as often as I should. I’m in a rush every single morning, so I only use it if I’m having a nice bath or a quick shower before bed! I also love using Palmer’s Cocoa Butter and Zoella’s Creamy Madly Dreamy Moisturiser as those absorb a little more quickly. We also have my current hand cream. Hand cream is essential in the winter months to avoid cracks in the skin – so I’ve opted for the No7 Protect & Perfect Intense Day Hand Cream (can’t find a link unfortunately!) This hand cream absorbs super quickly, which I love – there really is nothing worse than sitting waiting for hand cream to sink in so you can get on with what you were doing! It doesn’t have a strong smell, the consistency is reasonably rich, and it doesn’t leave that greasy feeling that some hand creams often leave behind! The next 3 are reasonably new purchases. On the left, we have Simple Kind to Skin Vital Vitamin Day Cream. I only use this on days where I’m not wearing any makeup – I’m trying to have at least one makeup-free day per week. However, as we all know, social lives can get in the way of that sometimes! My skin feels instantly replenished when I apply this moisturiser; it feels so luxurious, despite being a drugstore product! Like all Simple moisturisers, it sinks in really quickly. 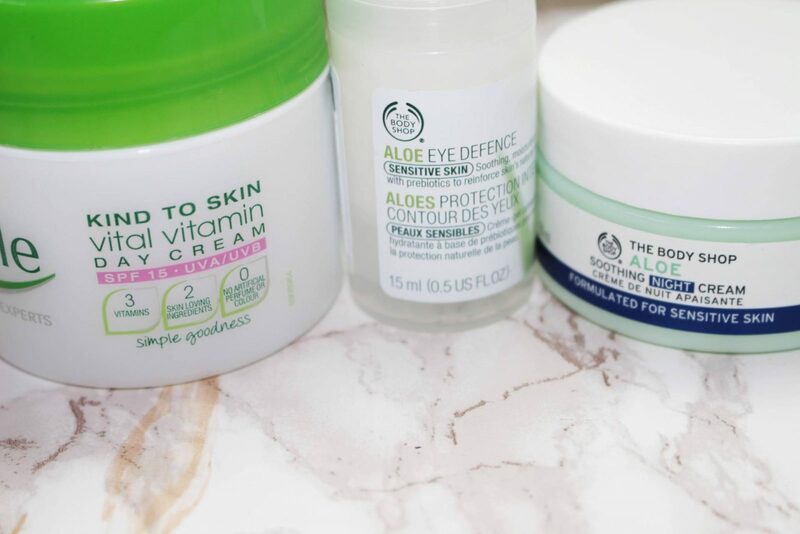 On the right, we have The Body Shop Aloe Soothing Night Cream – I’ve been meaning to pick up a new night cream for months and eventually purchased this one in June. I’m getting to that stage in life where people start asking if you’re using anti-ageing products, or at least a good night cream; one out of two isn’t bad! The aloe formula is designed specifically for people with sensitive skin. I did wonder how a night cream could be ‘soothing’ but it genuinely feels calming and soothing on the skin! Taking off makeup then applying this night cream is a lovely way to end the day – and when it absorbs as quickly as this one does, you can head to bed straight after applying! In conjunction with the night cream, I also picked up The Body Shop Aloe Eye Defence. I consider my eyes to be one of my best features, so I need to start taking care of them properly! Again, this is formulated for sensitive skin, and doesn’t feel greasy on application. The bottle is tiny – it’s only 15ml – but I feel that a single pump is plenty for both eyes – and I have big eyes! Its gentle formula means that it’s perfect for the skin around the eye area. Onto my 3 final products. Lush Mask of Magnaminty Self Preserving Face Mask is my go-to face mask of the moment. It’s not the nicest of colours (it’s made from peppermint, so it’s a dark green colour) and there’s a strong smell of mint (although if the name didn’t give that away, I don’t know what will!). It has the consistency of a scrub, so it removes any impurities as you wash it off. It’s ideal for preventing blemishes on the skin. 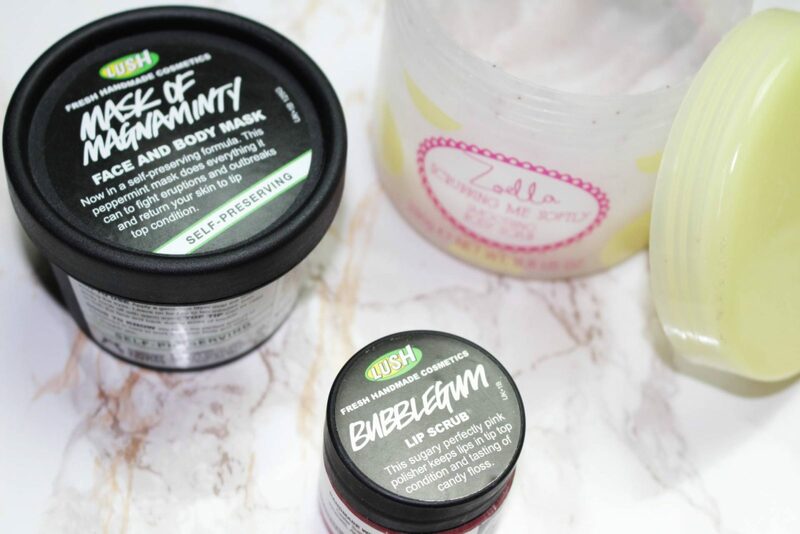 The other mask I reach for is Lush Cosmetic Warrior Fresh Face Mask – that one tends to be more fast acting. If you have a blemish that you need gone NOW, then that’s the product for you! As it’s a fresh formula, it has a life span of around 3 weeks; whereas the self-preserving last much longer – hence the large tub! My favourite body scrub right now is the Zoella Scrubbing Me Softly Smoothing Body Scrub. The tub I’m using has lasted ages! It has quite a solid consistency until mixed with water on the skin. It smells goregous and girlie, just like the rest of the Zoella range. It’s not too abrasive on the skin, so it doesn’t leave my skin feeling red like some others so. It also has cocoa butter in the formula to ensure that your skin feels super soft afterwards! The final piece of the puzzle is my Lush Bubblegum Lip Scrub. This is another firm favourite product of mine – and in winter, we need to be even more careful of chapped lips! Applying this before lipstick or lipgloss ensures a smooth base, and in my opinion, an even base means that lipstick last longer. Plus, the candy floss taste means it’s a little treat to lick it off!